I’ve been an iPad 2 owner for a year-and-a-half, but I plan to make the switch to this 32 GB iPad mini. I don’t want two tablets in my life, so I intend to sell my iPad 2 and use an iPhone 4S, a 2009 13″ MacBook Pro, and a 2012 iPad mini. This 7.9″ device is going to be my daily driver. I detailed some of my thoughts on the iPad mini’s killer feature in a post called “What I’ve been weighting for” (yes, the title makes me cringe, too), but here’s the gist of it: I wanted an iPad mini mainly because it was smaller and lighter. I believe tablets are becoming more and more capable as computers that can be docked at desks, but they’re also meant to be picked up. Even at 1.3 lbs., my iPad 2 feels too heavy to hold in my hands for very long. The iPad mini, which checks in at 0.68 lbs. (plus 0.15 lbs. 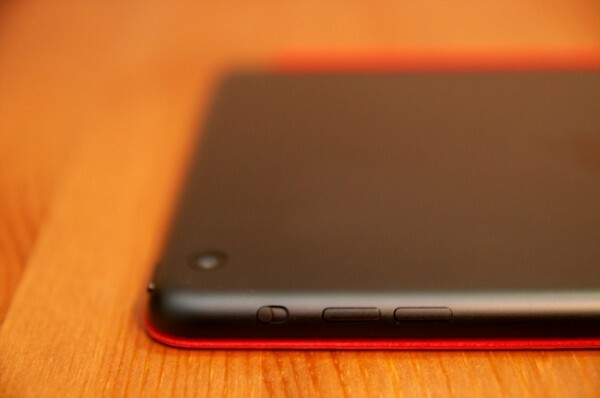 for the Smart Cover), is decidedly light. It’s pick-upable. Thankfully, the mini is still large enough to comfortably use at a desk with a stand and a Bluetooth keyboard to sit and write (like I’m doing right now for this review). But, more importantly, it’s also light enough to pick up and take with me to the couch where I can recline, load up iBooks, and watch 40 minutes of a movie on Netflix. This tablet is also diminutive enough in stature that I can comfortably take it out on a TTC streetcar, update iSource posts via my iPhone’s 3G connection, and spend 20 minutes reading a New Yorker article in Instapaper. 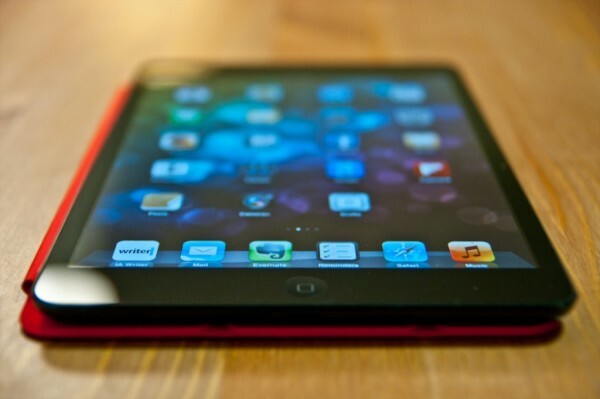 These aren’t just scenarios in my head – these are things I’ve already done with the iPad mini. They’re things I’ve always wanted to do with the larger, heavier iPad 2, but could not, due to the restrictive weight. I’m also really getting a kick out of putting the mini in pockets that the iPad 2 could never have fit into (similar to placing a MacBook Air in a Manila envelope). 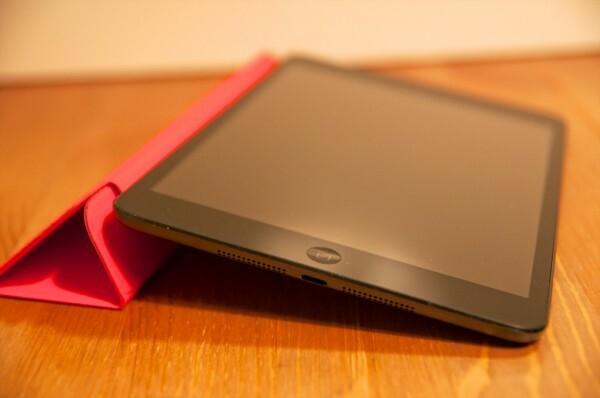 Writer Kevin C. Tofel has been saying for years that the 7″ form factor is the perfect size for tablets. I think he was very nearly right – I’m just glad that Apple decided to add an extra 0.9 inches. One thing I’m still getting used to is the thinner bezel along the sides (in portrait). I think this makes the device look more handsome overall, but it also decreases the amount of “safe” surface area for touching or holding the device. In other words, it’s harder than ever to keep your fingers off of the touch screen, because the iPad mini features more screen than ever before. Apple says that the iPad mini is smart enough to ignore touches near the bezel, and for the most part, they’re right. It looks like for most situations – aside from screens that use web view – you can trust iOS to intelligently distinguish between a purposeful and accidental tap. But you will probably have to get used to covering some of the screen as you hold the mini – which is an issue you almost never have to contend with on a full-sized iPad. There are also advantages to having the thinner bezel (and smaller screen): the iPad’s split keyboard is now perfectly easy to type on. I can comfortably reach every key along the home row without stretching, which means I’ll likely be spending a lot more time messaging from the iPad mini from here on out. I think the iPad mini is the most fetching iPad yet. From the chamfered edges (also featured on the iPhone 5) to the metallic buttons to the slate back…this thing just oozes quality. It’s definitely more slippery than I’d like, but there’s no question that this device is fun to the touch (to coin an awkward turn-of-phrase). I’d be surprised if the next 9.7″ iPad didn’t follow the lead of the iPad mini’s physical design. It has been widely reported that the iPad mini does have stereo speakers, but I haven’t seen many reports about how they sound. The mini isn’t great by any stretch of the imagination, but they don’t sound nearly as tinny as the 4S’ speaker, and they do sound clearer than the mono speaker on the iPad 2. Their positioning is also just a little better than on iPads two-through-four, simply because the speaker hole are actually right on the bottom of the iPad mini, instead of positioned on the back plate. These speakers are good enough to show a friend a song or watch an episode of Breaking Bad, but you’ll still want earphones or a Bluetooth boom box of sorts if you really want the mini to belt tunes out properly. Comics: Manga Rock 2 and ComicZeal still do a good job of displaying panels and text, and I don’t seem to have to zoom in much more than I did on the iPad 2’s screen. I’m looking forward to reading a lot more on this device. RSS and Web Surfing: Reeder and Flipboard are both fantastic, legible, and fun to use, even though Flipboard was the only one with an iPad-mini specific update. Safari: Safari is obviously ready for the mini because it’s one of Apple’s own apps, but I am definitely doing more zooming and panning than I did on my iPad 2. That’s because not every website is meant to be viewed on such a tiny screen. PDF reading: I do PDF reading on a semi-regular basis for incoming translation work, and the iPad mini definitely shows signs of a compromise here. This is the one area where I’ll likely be doing a lot more zooming and panning, but that’s okay for now. I tend to work with PDFs so slowly that the panning and zooming shouldn’t make too much of a difference. I’ll be keeping an eye on this, though. Writing: iA Writer, Posts, and Drafts all work beautifully, and writing is helped tremendously by the angle of the redesigned Smart Cover. I’ve typed over 3000 words on the iPad mini since receiving it on November 2. There’s something tremendously exciting to me about having a capable writing machine that fits in the palm of my hand. Gaming: The iPad mini may well be what unlocks iOS gaming for me. The iPhone 4S is great for 2D games, but I find it a small, squint-filled experience for 3D games. The iPad 2 looked great for Real Racing 2 and Tilt to Live, but their accelerometer-based gameplay quickly took its toll on my wrists. But those same games on the iPad mini are perfectly playable – enjoyable, even. I’ve been eyeing Bastion for a while on the App Store, and I think the iPad mini will be the device I’ve needed to play it properly and comfortably. Twitter: I have had to crank the text size up to Large, but otherwise Tweetbot for iPad is perfectly usable. One of the biggest reasons that many techies are holding off on an iPad mini purchase is the lack of a Retina display. There’s no doubt that I’d love to have a Retina display on an iPad, but seeing as I’ve never enjoyed Retina for any significant period of time on an iPad, the iPad mini’s screen doesn’t bother me in the least. In fact, it looks sharper at 163 PPI than my iPad 2 does (at 132 PPI). I understand full well that there are sharper displays on completing tablets and the iPad 4, but that isn’t killing me right now. The iPad mini is plenty sharp to my eyes when I set it down on a desk to write, or when I pick it up to read. Siri is a great fit on the iPad mini. It’s easy to dictates quick messages, ask for movie times, or switch apps. It’s also extra awesome because Siri can be summoned by holding the Home button down on my Bluetooth keyboard, making it even easier to switch between apps, or start playing different albums. I just wish that Apple would allow us some way to activate Siri with a gesture. I’m not convinced that tablets make for good cameras, simply because they’re difficult to stabilize and hold for photo shoots, but I’m glad to have a better camera on this mini, if only for video. My 4S was my only device capable of recording decent video – but with the mini, I now have two, and I can use one to film the other (for reviews). I’ve already published a separate Smart Cover review for the iPad mini, but long story short: it’s still expensive, but I really like having a Smart Cover around. It makes an even better stand than the first-generation Smart Cover, and it’s great for adding a splash of colour your slate or silver tablet. Even more than the 9.7″ iPads that came before it, the iPad mini makes a lot of sense in a hierarchy involving a smartphone and laptop. The 7.9″ screen is different enough from my 3.5″ smartphone and 13″ notebook. I can do a lot on my iPhone 4S, but I don’t necessarily want to use a screen that small for hours and hours at a time. My 2009 MacBook Pro is still an amazing machine that’s a pleasure to use, but there’s something different about interacting with a desktop-class operating system. iOS has spoiled me, and I like the way I can concentrate on just one task a time with iPad apps. I plan to treat the iPad in much the same way I used my iPad 2 – as a laptop-like replacement for when I head out the door. However, because the iPad mini is so much lighter, I think it can also cannibalize a lot of the time I would otherwise have spent on my iPhone, simply because of the extra screen space. It’s still hard to tell whether I’m more sold on the size of the iPad mini, or the weight. The weight was definitely my reason for buying it, but the smaller screen surprised me by making certain portions of iOS easier to use (the software keyboard chief among them). What I’m absolutely sure of is how much I prefer this iPad mini to the iPad 2. I know it’s not the fastest tablet on the market, and it’s certainly not the cheapest, but I believe this is the device that delivers most on the promise that tablet computing holds. I’m excited to get to know it better. Great that Siri works with your keyboard – that’s what I’ve been looking for – but WHAT keyboard do you use? Most of the time we are unable to see a big difference between the screen resolutions from one device to another which is why there are so many debates among what resolution looks the best. Not having the retina display on the iPad mini probably won’t have a major impact on people looking to buy this product.